I'm thinking about possibly replacing my old Volvo in the new year with something a little more modern (maybe 10 years old instead of 20 something...), and preferably automatic as I now commute by car and have a dodgy knee which doesn't like stop/start traffic much in a manual. I'm thinking an E91 touring, preferably auto and with a large petrol engine, so 325i or 330i, would fit the bill. I'm not really a fan of diesels, my commute is about 25 mile / day round trip so not too bothered about economy so long as it's not worse than the 20ish mpg my Volvo does now. Has anyone owned one (or same age saloon/coupe version?) and have any advice, things to look out for, things to avoid etc.? I'm specifically interested in the prospect for DIY maintenance, any potential auto-box issues (are they 'sealed for life' so get neglected oil change wise? ), that kind of thing. I used to have a E36 328i auto touring and loved it, so basically a more modern version of that is what I'm after but alternative medium sized estate suggestions welcomed too? I quite want a Skoda Yeti but for some reason dislike VAG autos and think a 4 cyl car would seem a little dull after the 5 cyl Volvos and 6 cyl BMWs I've had? I love Volvos but nothing they've made in the last 15 years appeals really. Last edited by Stu; 29-12-2018 at 01:36 PM. I did 170k miles in an E92 with almost no issues. Most common problems concern turbos and swirl flaps in the diesels and crank shaft sensors on the 320i, both of which you’ll sidestep with a 325i/330i. Personally I’d suggest you get one without satnav. It runs the first gen iDrive which is clunky at best, and the functions can be bettered with a Parrot/Bluetooth set up. The auto box is largely bombproof and coped with 550lb ft in my car without complaint so should be fine. I have a E91 & your more than welcome to come try it. Yes its a diesel and manual but it will give you idea of the car. DIY maintenance is ok to a certain extent. Compared to the Volvo i would say you'll be amazed at how LITTLE space you get for loading etc. Why would you not want to keep the Ovlov? Cheers, Kev - very generous. My mate has a 320d touring in this shape, has for maybe 5 years ish so I've had a poke around it in terms of relative size compared to the Volvo. You're right the boot is a fair bit smaller but should be fine for my needs (I have a van for moving big stuff, camping etc.). 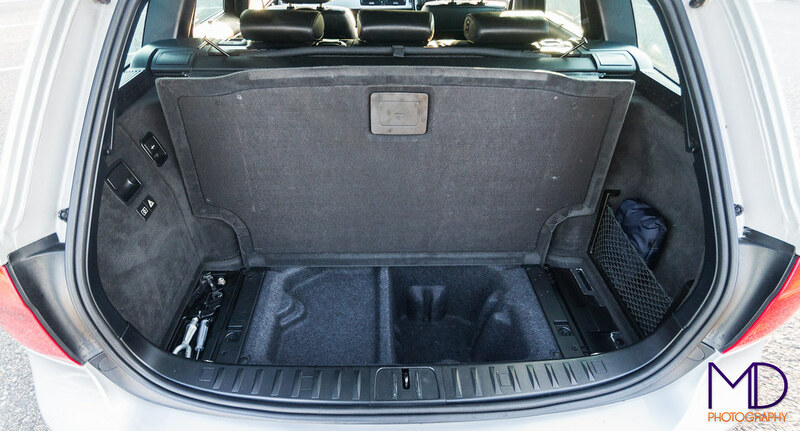 The Volvo boot is very handy though as it's rare you find something that won't fit and needs the seats folding. Hi Dave, I'm still not sure I could part with the Volvo to be honest, but weighing up options to decide whether to invest more time and cash in it fixing the AC and a few other things I'd need for it to become a year round commuter. My main worry with newer cars is lack of character really, I like having the weird old car in the work car park - it suits me but I would really like an auto and working AC so seems to make sense to go newer... maybe. I have the old BMW E30, as you know, which is supposed to be my toy / classic and can't imagine getting rid of that either... but how many cars can you need...? Last edited by Stu; 30-12-2018 at 04:09 PM. Hey Kev - quick E91 question, does yours have a spare wheel (or at least the space to have one) or runflats? I really prefer to have a spare wheel. Like an ABS pump BMW's of that vintage, don't they? My brother had a saloon 325i, served him well right up until it didn't. Aged much quicker than my E39 did. I went from a 2004 V70 to an e91 330 Touring. The Volvo was more spacious so if you carry a lot of fridges and wardrobes around then give that consideration. Aside from that the 330 is a superior car in every way, and so far pretty reliable. The 3 litre N52 engine is a peach. Thanks, Kev - one of my gripes with my wife's MINI is lack of spare wheel (or room to fit one), sounds like this would be similar. In what way do you mean it aged quicker? Like wore out due to lower build quality or just started to seem dated? My Volvo is that out of date / unfashionable that an E46, E39 or anything newer than that would seem space age to me. That said, the 850s basic old fashioned mechanical simplicity is what attracted to it as its so easy to work on. On that subject, I had discounted E46 330i models on the basis that they'd probably be a bit worn out by now, but a well looked after one may not? Most I see these days have gone a bit scabby but there must be some good ones left as they aren't that old. Thanks, Kurt - very useful. Is yours an auto? What year? I believe the N52 is the earlier (potentially less troublesome) engine they used from some reading on Pistonheads so potentially the one to seek out? Before my Volvo 850 I had a V70 phase 2 T5 (2002 vintage) which was posh, spacious and great in a straight line but nowhere near as fun as the older 850 in terms of steering feel and handling. I prefer the look of the older squarer cars too, as you say, they are ideal for wardrobe transport though! Last edited by Stu; 01-01-2019 at 03:57 PM. Ours is a manual so can't really advise on the auto box. But yes, you are correct about the the N52 being the earlier engine (ours is a 2006). 258bhp is plenty for road use IMO. Economy respectable - low 20s for short town journeys but mid 30s for long journeys. I liked my E90 a LOT (325d). Not a big car, by any means. 3.0 petrol Auto would be a lovely cruiser. Interesting you mention the spare wheel, that was a big part in me shifting the M-lite last year. I was using it for long trips away from home without run-flats and without a spare wheel. A recipe for unnecessary problems if ever there was. The 3 litre N52 engine is a peach. We have that engine in the Z4 and it's fab. I was using it for long trips away from home without run-flats and without a spare wheel. A recipe for unnecessary problems if ever there was. Off on a slight tangent here, but the lack of spare wheel and long journeys bothered me in the Octavia. As you say, a recipe for disaster! I ended up buying a Golf space saver that was unused (for £50) and a small scissor jack from Halfords for £15. It took up very little room in the boot when strapped to the side. Thanks for the comments, sounds an earlier model E91 330i with the N52 engine is what I need then - I will keep an eye on the usual classified sites and see what I can find. Has to be auto, have heated leather and preferably not be silver. Aside from that, I'm pretty flexible. Anyone know or recommend any owners forums to read up on common faults and look at 'for sales' ? That's a good idea, Jon. I really don't like the idea of a car with no spare wheel for anything other than local trips. Not sure the E91 boot would accommodate even a space saver wheel very well though? The Octavia boot is much bigger I think, my mate has one and it's huge back there - more like Volvo size boot! I have an E90 335D and really love it! Can't say much more than that. Boot space is shocking, but then I never got it to lug around stuff. Got a van for that. If it were my only vehicle I would definitely have looked for a Touring. I'm still browsing for larger engined BMW estates for sale every now and again to keep an eye on the market for a potential purchase in a few months. Haven't seen many of these crop up, a 545i touring. Presumably massive bork potential, but look at the massaging seats! Anyone owned or driven an N52 engined (pre 2007 ish?) E9x 325i vs. a 330i? I've been keeping an eye on the market for a while and really nice spec 325i auto tourings pop up regularly for about £4k or under whereas 330i seem much less common, higher miles and about 50% more expensive at the same age. Specs suggest the 325i auto would be comparable in performance to my old E38 328i auto which always seemed to go ok and return surprisingly good economy. Obviously a bigger engine is always better, but if the 2.5L was torquey enough to pull along the auto nicely it might do for a daily and still have a nice sounding proper 6 cyl? KurtR has one and likes it, manual though. Edit: Just noticed he said that already :D.
In period, I read that the 325i felt constricted after the 330i. Which it is as they put on a very restricted inlet to cap the power (making more room for the 335i). I’ve looked at e9x a few times and figured that it had to be a manual 330i. I would, however, probably be open to an SE if (a) the colour was decent and (b) the interior wasn’t gopping. A few hundred quid will get you a Sport interior from eBay (I slouch in the car, so need a little support ideal), but you could still be stuck with a beige and wood dash... . Chassis-wise, the SE could be spec’d with Sport suspension and the Sport spec’d with Comfort suspension. At this stage, it will all be shagged anyway. Options will all vary between Sport and SE, but in reality there won’t be much in it. I’m not too fussed about paying the extra couple of grand for a Sport - you’ll get that back at resale - but it is about opening up the market a bit. Cheers, chaps. I'm still on the lookout for a 325i or 330i auto in a decent colour with decent interior and spec. I'm not too bothered about a Sport model, would prefer SE really assuming more they have comfortable suspension but yes, the dash is nicer on the Sports and seem less likely to have grim interiors as Simon mentions. Spotted a cheaper 330i sport touring on eBay pop up not that far from me at just under £4k but a). it's silver, and b). it's a CAT D.
Also noticed a 335i sport touring appear on there which got me thinking... but it's the other end of the country and probably more hassle than I need as it says in the ad the panoramic roof needs new seals, plus extra complication of a few turbos strapped to it obv. ... then last night a grey 2004 E46 330i Sport auto estate popped up on eBay with reasonable miles, good spec (heated leather, climate control, xenons) to tempt me. Agreed a deal on it today and collect next week. Fingers crossed it will be a worthy Volvo replacement, will see how I get on with it and if it doesn't blow up within a few weeks, grudgingly put the Volvo up for sale, I suppose. E46 LCi so all initial issues ironed out and still ‘modern enough’ not to feel like you’re driving a classic! I did about 150k miles combined in two E46 330d Tourings back in the day. A decent steer too. Do check for rust. A lot of e46 are getting grotty now. Northloop.co.uk - at the forefront of political debate since Tuesday. Yep - definitely top of my list to check, any pointers on specifics beyond the front wings, sills etc. ? Also, any M54 engine specific stuff to look for beyond the usual checks? Plenty of stuff out there if you google. Rust wise, just about anywhere. Look at the thin strip that runs between the sill cover and the bottom of the doors. Any bubbling showing on the strip and it is pretty bad behind the cover. Rear arches also can get nasty. M54 reasonably tough. Oil separators can lead to random white smoke from the tailpipe, occasionally see them with timing chain chatter, oil leaks from warped plastic cam cover and they don't wear overheating well. Oil filter housing bolts the the block through a rubber string gasket. These go hard and oil sluices down the side of the block. They usually burn oil, some quite a lot. As with anything look at the service history and use your eyes, ears and nose. Last edited by Uncle Benz; 16-04-2019 at 09:35 AM. Quick update to say I collected the E46 on Thursday, all checked out and seems a good one (fingers crossed!). The seller encouraged a long test drive, then I drove it home 130 miles in pre bank holiday traffic which took about four hours in hot weather - all ok. Preparing my Volvo sale now as this will replace it. Still think the Volvo is slightly quicker in a straight line!